Just noticed this - Gourmet Magazine as created a set of free recipes exclusively for Amazon.com. You can download them from the bottom of this page at Amazon . Enjoy! The Moosewood Cookbook was the first cookbook I ever owned. Never having resembled anything close to a vegetarian, I was skeptical when it was recommended to me. But I was poor, having just moved into my first apartment in New York City and I figured broccoli was less expensive than chicken or steak. 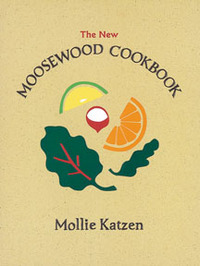 This cookbook was written by Mollie Katzen when she was a member of the Moosewood Collective in Ithaca, NY. It has since been named to the James Beard Foundation Cookbook Hall of Fame (2007), has several million copies in print, and has been named by the NY Times as one of the best selling cookbooks of all time. Over the years, Moosewood has taught me how to make good veggie stock (which I use for everything now), fantastic guacamole, and the best black bean soup I've ever had. I can't recommend this volume enough - soups, stews, appetizers, and main courses that all bring out some fantastic flavor. Summertime is right around the corner. Some folks wait till Memorial Day to light up the grill for the first time, but I tend to start a bit earlier. I have a number of my own recipes that are tried and true standards for me, but whenever the coals are hot and I need inspiration, I turn to Weber's Big Book of Grilling . Even if you already have a BBQ cookbook or two on your shelf, I highly recommend this one become an addition to your library. And remember, it's never too early to start grilling!